Product #16571 | SKU LRB2-07-PR | 0.0 (no ratings yet) Thanks for your rating! 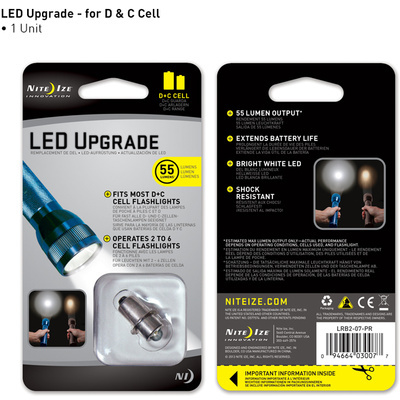 The Night-Ize LED Upgrade Module replaces the original incandescent bulb in two to six C and D-cell Maglites with the PR-style flange to increase the output and runtime, while maintaining the familiar Maglite form and function. Installation of the module is as easy as changing the bulb because the module housing uses the same push-and-twist bayonet mounting system as the stock bulbs. Upgrading your light to LED not only increases brightness and battery life, but adds shock-resistance and a significantly longer lamp life.